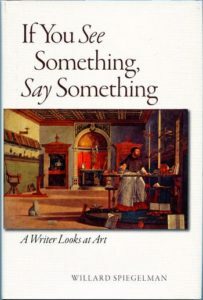 Critic and essayist Willard Spiegelman returns to the show to talk about his new book, If You See Something, Say Something: A Writer Looks at Art (SMU Press), collecting his art reviews from the Wall Street Journal. We get into the notion of legacy after his retirement from 45 years of teaching, then tackle the process of learning to look at paintings, his favorite museums, the question of whether Hockney’s happiness makes him less of an artistic genius than grim/tormented artists, whether one should buy art to match one’s furniture, his love of Marfa, TX, the differences between being a pilgrim and a tourist, the role of curiosity as a remedy for boredom, the challenge of editing a literary magazine in this day and age, whether he’s a role model to younger gay people, the first time he had a student who was the child of one of his first students (that is, when he realized he was getting old), and more! Give it a listen! And go buy If You See Something, Say Something! Willard Spiegelman recently retired from his role as the Hughes Professor of English at Southern Methodist University in Dallas, where since 1971 he taught generations of students how to read, to write, and to think. 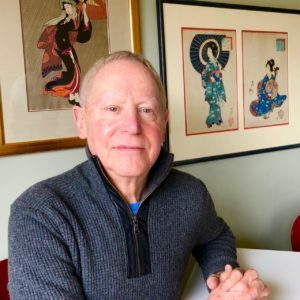 From 1984 until 2016, he was also the editor in chief of Southwest Review. He has written many books and essays about English and American poetry. For more than thirty years, he has been a regular contributor to the Leisure and Arts pages of The Wall Street Journal. He has two previous appearances on The Virtual Memories Show in 2013 and 2016. Credits: This episode’s music is Nothing’s Gonna Bring Me Down by David Baerwald, used with permission from the artist. The conversation was recorded at Willard’s NYC apartment on a pair of Blue enCORE 200 Microphones feeding into a Zoom H5 digital recorder. I recorded the intro and outro on a Heil PR-40 Dynamic Studio Recording Microphone feeding into a Cloudlifter CL-1 and a Mackie Onyx Blackjack 2×2 USB Recording Interface . All processing and editing done in Adobe Audition CC . Photo of Mr. Spiegelman by me. It’s on my instagram.